In the criminal justice system, the people are represented by two separate yet equally important groups: the police, who investigate crime, and the district attorneys, who prosecute the offenders. These are their stories. [thunk thunk]<–That’s the Law and Order scene change sound, duh. And this is my story, of being an extra on Law and Order. To sum it up, it was a lot like jury duty, where I went in thinking it would be super exciting and I would get to change the world (well, maybe not in the case of being an extra, but anyway), and by the end, was totally bored and unable to knit. But still, interesting nonetheless. First, we were put into a “holding” area in a church, where we sat around for a long time. I read an entire article in this week’s New Yorker about Ian McEwan, which was very uninteresting. Much like Ian McEwan’s books. 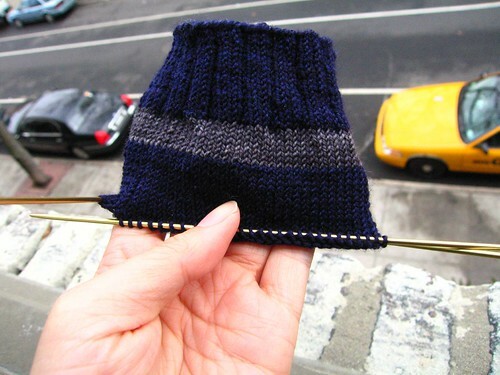 Anyway, I also knit a stripe and a half on Adam’s sock (above), and listened to the insane conversations of my fellow extras. They must have tried to cast primarily Asians because we were going to be gallery-goers for Chinese Communist propaganda art show (amusingly for me, something I actually know about, and thus, might have potentially attended in real life) and I thought this was a little unusual. I was like “Asians! There are only two acceptable professions for our kind! Lawyers and doctors!” I never realized that there were so many Asian extras. So many disappointed parents. Anyway, moving on, there were also many older extras with thespian dreams (reading material of my fellow extras: scripts, the trade newspaper Backstage, a biography of director Eliza Kazan, etc. ), and not to be a dream-crusher, but if you’re in your 40s or 50s, you are probably not going to Make It. Pause: As I mentioned, normally, I work in magazines, and though sometimes magazine writers can be wacky, they’re generally pretty professional. The extras reminded me of a totally different deluded group: wannabe novelists. My first job in publishing was reading the slush pile, or unsolicited manuscripts, for a publishing house and the amount of totally insane manuscripts written by deluded writers that I read made me realize that there is a whole group of people with unrealized but hopeless dreams. I harbor novel-writing dreams myself, so I get it, but really, if your book involves a clown who lives in cranberry bog, it’s probably not going to be published. Anyway. Here are my two favorite overheard conversations. The first one was between a 50-something man wearing more eye makeup than Jenny Humphrey and a 40-something woman. Man: Well, I’ve been working on a play. Man: I gave it to Andrew Lloyd Weber, and he wrote me back. Do you want to see the letter? Woman: (Reading letter) Wow, the ink has faded on your letter. Um, so have you sent your play to other directors to be produced? Man: Oh sure, I sent it to 10 other directors, but I don’t need to, because Andrew Lloyd Weber is going to do it. Man: Because Jesus told me. Man: Yes, well he’s currently working on a sequel to Phantom of the Opera, but Jesus told me that he’s not going to do that, instead he’s going to score and direct my play instead. [Gives confusing synopsis of his play–something involving monks.] Oh, [here the man leans in close to the woman, who he clearly knows from before] and of course, I’m going to give all of my friends first shot at some of the supporting roles. Man: [mistaking her query for actual excitement] Oh yes, there are going to be a lot of supporting roles–I think one would be great for you. Like maybe being a household maid. You’re Asian, so you would know a lot about the culture. Woman: You should have your mother try to be in it. Man: [Faux bashfully] Well, I was really hoping she would try out for the lead, but it’s going to be a musical–Andrew Lloyd Weber, you know. You do know who he is, right? Anyway, of course Andrew will be writing it as a libretto, and I’m not sure my mother has the singing chops to take it on, but I hope so. Man: You know who I hate? Bob Wong. [not the actual name. But he said a name of someone I had never heard of.] I mean, he is the worst, he has a big mouth and no talent. It’s one thing if you have a big mouth, but a lot of talent, like me, but no talent, ugh. Woman: Well, you can say what you want about Bob, but he put himself out there and he’s really well known. Man: Well, you know how he got ahead? So anyway, at this point I began to despair a little bit for humanity, but wardrobe came around to approve our clothing. I was disproportionately pleased because the wardrobe head liked my (own) dress a lot, and deemed it “very sophisticated,” whereas other extras were sent back to the wardrobe truck for new clothes. Then, we had to go to the set and film a minute-long scene for hours. Seriously, I have both a new respect and disdain for television, because there are so many people (staff, extras, sound people, etc.) for each minute of television, combined with hours of rehearsals. On one hand I was sort of impressed, on the other, I was like really? Can’t you make this quicker? Do we really need to check the lighting on these people for THREE hours?!? The entire scene was seriously less than a minute. I’m reserving the right to do more extra work (especially if Gossip Girl ever needs extras! ), but I have to say that in general, I was happy to cross “being an extra” off of my to-do list, and move on. Posted in travelingproject, Uncategorized, Weird Life Experiences at February 19th, 2009.